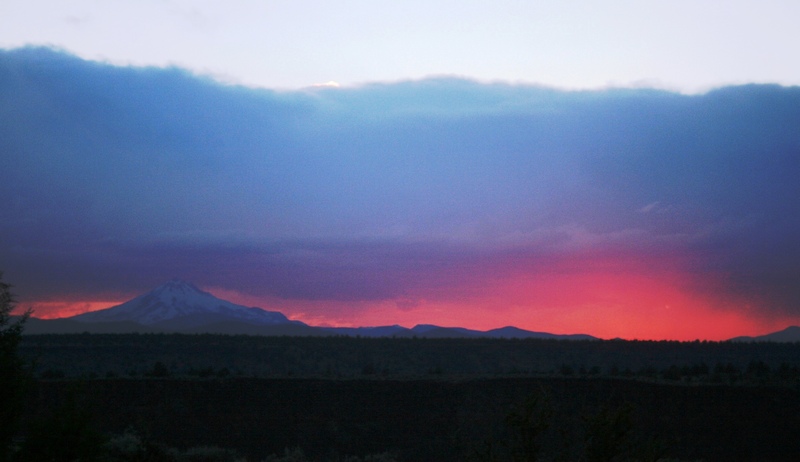 Once a week, many folks meet at the Deschutes Amphitheatre to embark on a journey. Hardship Hikers follow a late 1800’s Jefferson County (fictitious) settler up the Tam-a-lau trail to their homestead destination. What would normally be a regular ole’ early bird hike up the Tam-a-lau trail has been transformed this August, in light of our homesteading history month. You see, the folks that are brave enough to show up at 7:30 am know that they aren’t just going on a hike, but experiencing what it was like to try and survive living in the high desert a homesteader in the late 1800’s. They are fully aware and ready to experience what it was like to carry water many miles over hot, exposed, and steep terrain. With a pioneer or two as their guide (our own Interpretive ranger and hosts in living history mode!) they are guided to the top of the platau, making their way to their hypothetical homestead while working together to carry a bucket of water. Yes, this lady dressing and acting as a pioneer may time travel to present day to be a park ranger in her spare time, and likes to take safety into consideration on this treacherous hike, so if you would so kindly ignore the backpack! Before we begin our hike, we decided we would always offer the idea of carrying the bucket, just in case the idea of carrying one put any hiker in a serious disposition. I mean, all these visitors are on vacation, right?! Amazingly, every group has responded keenly to the idea of carrying the water, to get a true perspective as to what it was like to haul water up one of the Cove’s many “water trails”, which are trails carved in the cliffs and steep terrain so that early settlers had slightly easier access to and from the river. 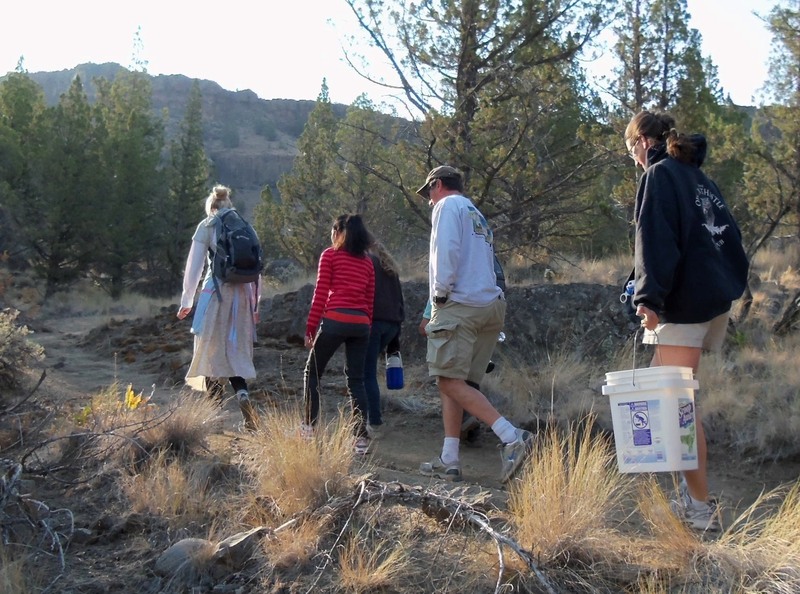 Visitors appreciate the perspective of knowing the challenge of carrying an extra load, up a steep trail, and keeping water in the bucket from escaping. To imagine that when you wake up thirsty in the middle of the night, you couldn’t just walk your bare feet over to the faucet, but instead, had to walk nearly 2 miles down to the river. And, not to mention the concern of water quality, we’re guessing that they weren’t exactly able to sip on their camelpack on the way up! “Cove Settler” lady shares some information about how sage helps her hair stay shiny! This week’s group, working as a team and trading off, managed to carry the bucket all the way to the top of the trail without spilling a drop. After taking a short break, we went on to search for on trail evidence of previous dwellers of the area, and came across huge piles of rocks and twists of old barbwire. 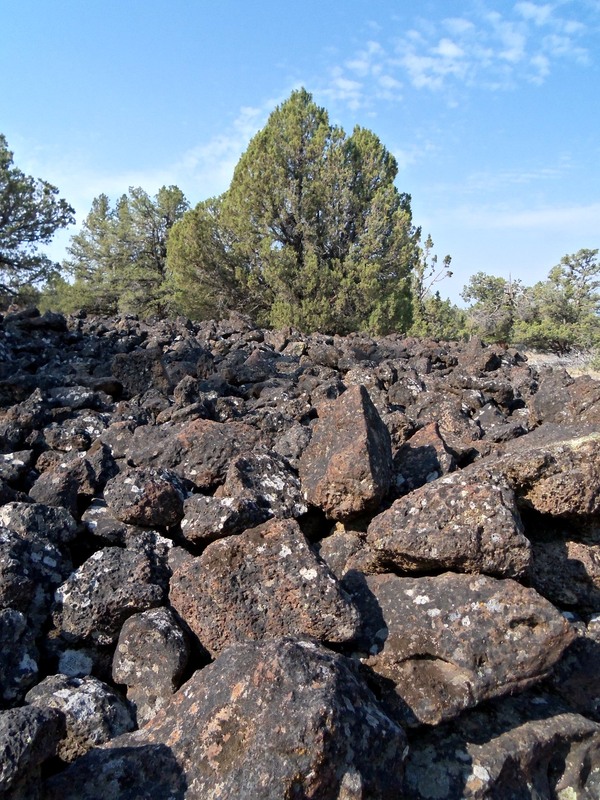 Rocks were removed from terrain and placed in these giant piles by homesteaders to create open cattle grazing land. 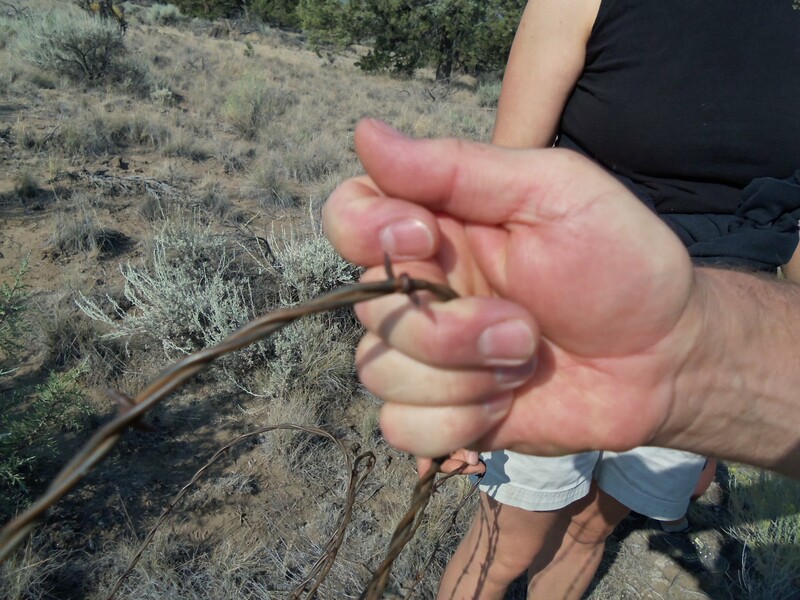 Unique barbed wire from early settlers of the Cove. A diving Turkey Vulture is closely followed by a curious flock of swallows. 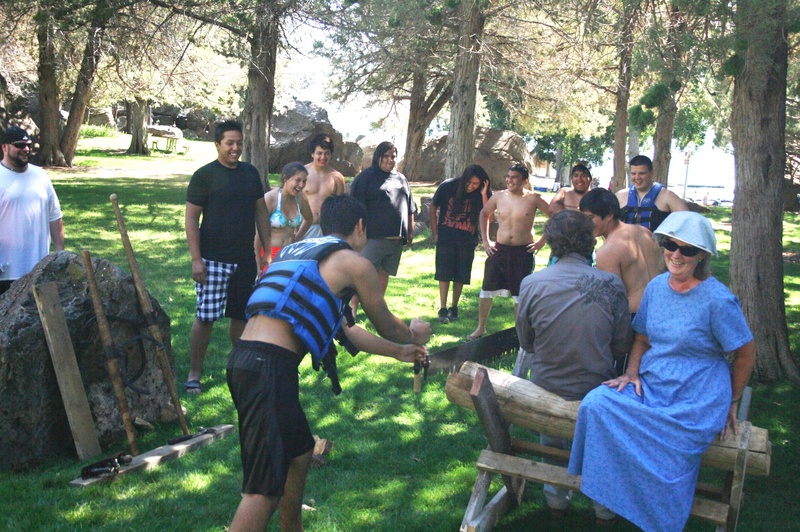 All in all, to get an experiential perspective on how it was to survive the high desert for those who weren’t so lucky to settle on the banks of the river has been a good one. Next year, perhaps we will add an element of finding food and building shelter as well (also not an easy task!) 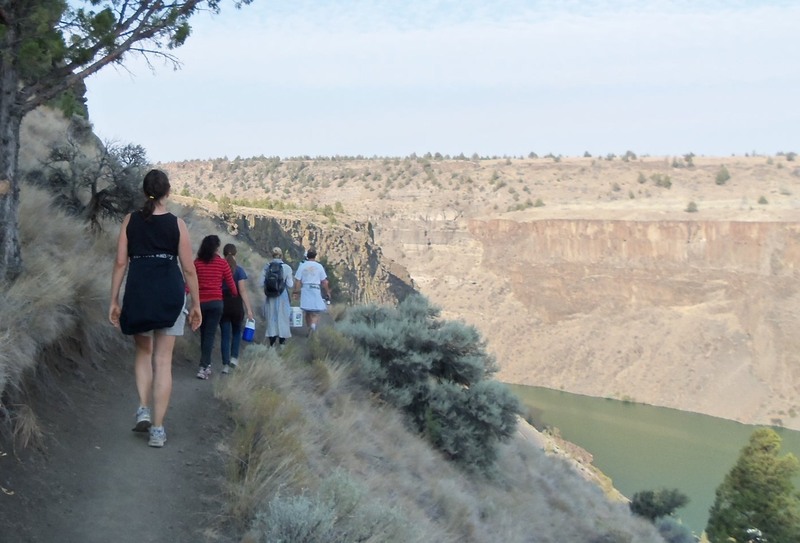 We are inspired by our interested and enthusiastic Hardship Hike participants! 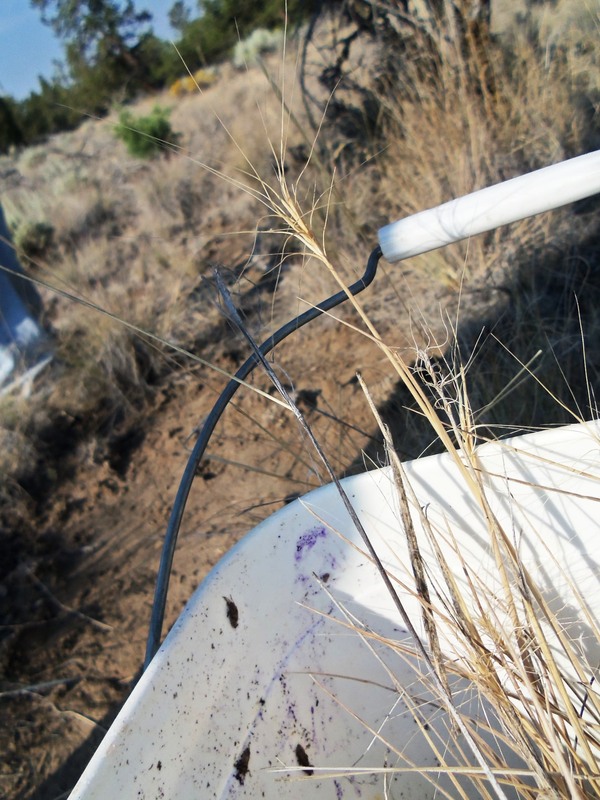 After the group made it to the top, we used the bucket to carry some invasive Medusahead (taeniatherum caput-medusae) weeds that we pulled along the trail. 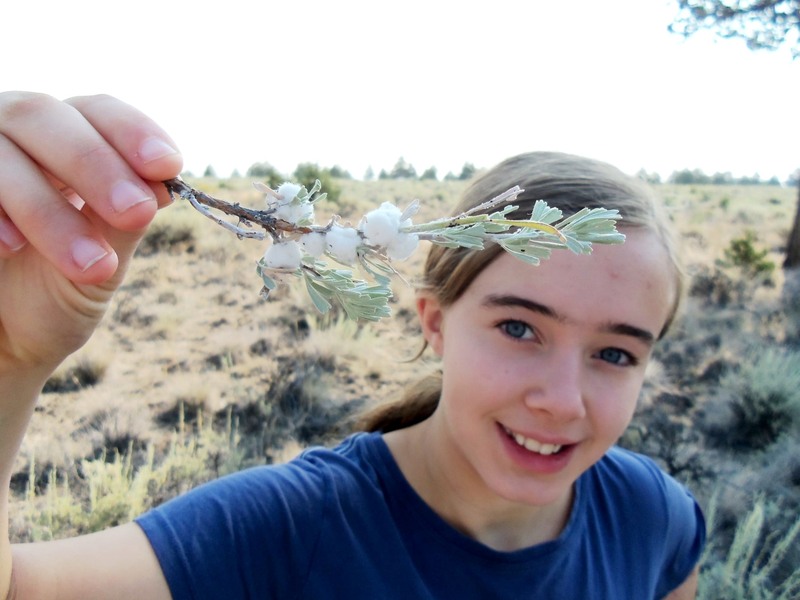 Young hardship hiker holds piece a sage with mysterious white puffs…do you know what they are? 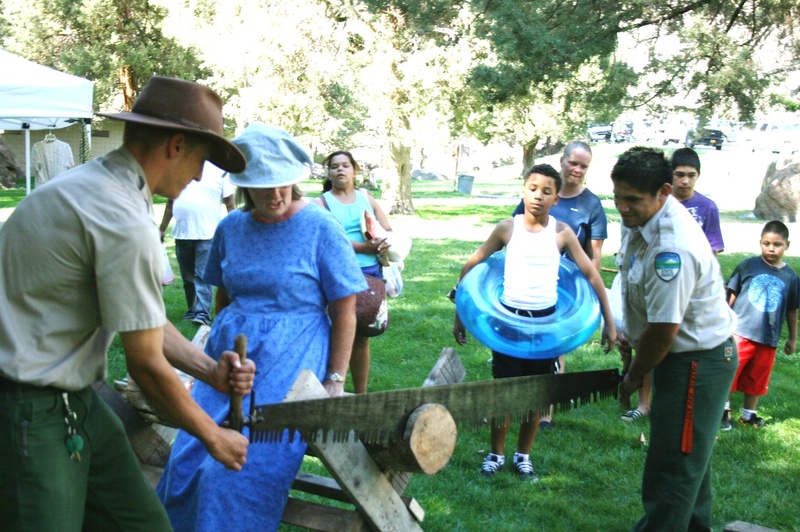 Two park rangers demonstrate the crosscut saw for visitors at the Pioneer Palooza. This August, the park’s interpretive team debuted Pioneer Palooza: Saturday’s dedicated to the Cove’s homesteading history. In attempt to give visitors a true, hearty homesteading experience, we were on a grand search to find traditional logging tools that could be demonstrated. Our friends at the Collier Memorial State Park and Logging Museum pitched in by providing us with an excellent set of swede hooks and a well-conditioned crosscut saw (aka the “Misery whip”). After some searching on our part, we managed to muster up a draw knife, hand-saw, and rotating hand drill to demonstrate as well. The goal of this program is for visitors to understand the challenges that went into building a homestead from a 1860’s-1930’s era perspective, using only the tools that inhabitants quite possibly had available at the time. We compare the pros and cons of the tools to some of the power tools used today (chainsaw, cordless drill, etc.) and place imaginative scenarios so one could really think of all the different facets and back-breaking work that went into building a simple homestead, which the Cove has demonstrated on a very small scale. Visitors have appreciated the new perspective, and even broke a sweat trying to saw one small section of log with a crosscut. Now imagine that, multiplied by 100’s more of the logs used to build a cabin. Now that’s some hard work, darn tootin’! Visitors try their hand at at the crosscut saw in the Crooked River Day Use area. Summer at the Cove usually brings sunshine and lots of it. 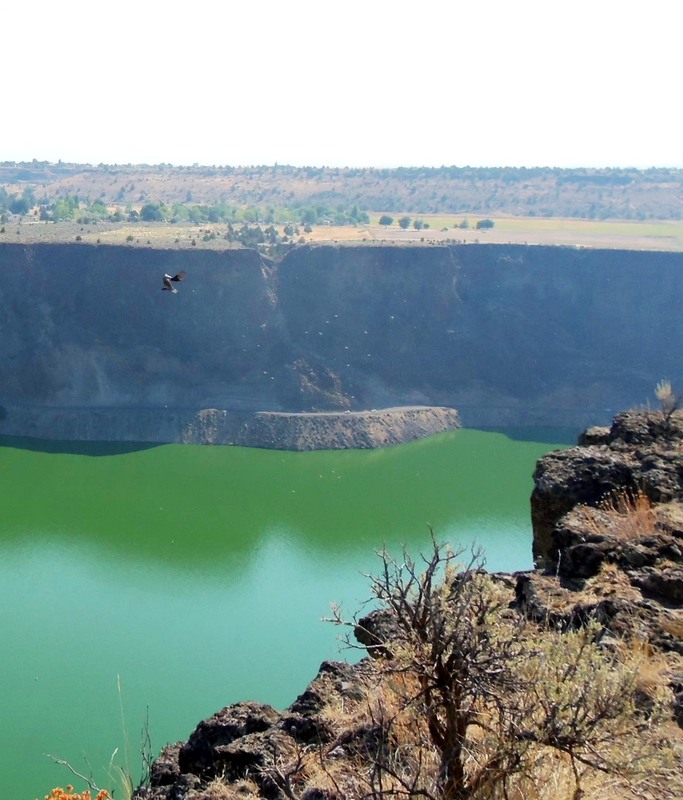 Visitors come from miles away to slather on the SPF and play under the hot rays in Lake Billy Chinook. 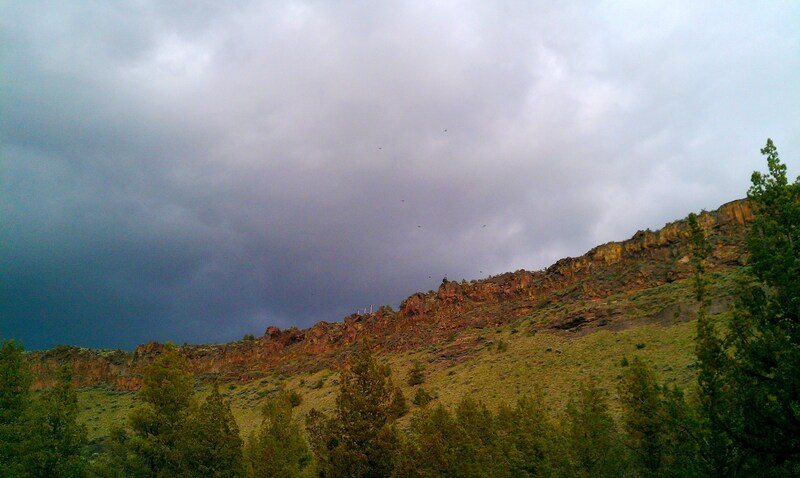 Since Cove Palisades State Park is located in the High Desert of Central Oregon, the park is also known for it’s sudden and unexpected THUNDERSTORMS! And for those visitors who didn’t get word of the park’s susceptibility to these wild thunderheads or quick floods of rain, they are in for a mighty surprise when everything in camp becomes soaked in T-30 seconds! This sort of weather happens a few times a summer, most years. The arid environment and lack of usual rain causes the terrain to “crust” over, in a way, for miles. Because of this hardening of the soil, when it does decide to rain, it takes much longer for the water to saturate into the ground, so what does it do instead? It runs right over the top! And some of the campsites that happen to be near a slope or a low flat area, they experience a saturation of their own. Usually ending in laughs, and a few disgruntles, if storms bring in the rain they usually soak tents and t-shirts and are often followed by more sunshine quick to come. As much as we wish we could control the weather, we can’t, but there are some things visitors can do to prepare while camping. These storms bring wind, and those who don’t have the awnings of their trailers rolled in will sometimes get them blown straight off, and tents might blow away that aren’t properly staked. It’s important to make sure your camp area is properly secured when you leave to head out on the boat for the day. If you see any clouds, it might be a good idea to throw that rainfly on and waterproof your gear as well, especially if you plan on being away from camp most of the day. The Cove is an excellent place to view storms, with it’s wide open scenery and opportunities to see the high desert in a broad perspective and witness some rockin’ sunsets. Many plants and animals of the high desert have excellent adaptations that allow them to store water for long periods of time, so when water is few and far between, they embrace an opportunity to drink up as much as they can!